Winter seems endless. While awaiting the long overdue thaw, my fixation with winter coats has accelerated. However, I haven't found a pattern or a fabric that makes me happy (yet). This is the one I covet. Yes, I know it's a man's coat, but my stylist daughter and I have decided it that it would look fine on a girl, or at least easily adaptable to my form. 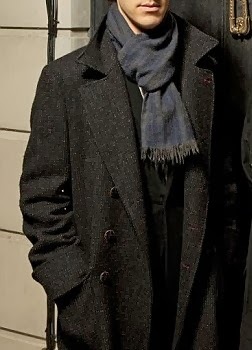 The recent Sherlock episodes have definitely fed my obsession with coats. And tweed. Back to real life. To prevent my daughter from swiping my old pea coat, I found a newer doppelganger on eBay for her. It was advertised as "excellent" condition, and lo and behold, it really does look completely new (but the shoulders are straight out of the late 80's/early 90's). This one is red, which suits her even better than the navy. Unfortunately, it did not have the extra warm lining that mine did, only thin acetate. My assumption that it was lined to warm in even frigid conditions -- since I was purchasing it from an Alaskan -- was clearly wrong. No worries, I sewed a removable quilted lining. It's a pretty simple design. I made a rub-off, by copying the princess seams of the coat, and decreasing the height of the neckline. The hemline is about an inch higher than the jacket's hemline. I suppose I could have done a zip out lining, but that would have involved deconstructing the jacket and lining, and I really didn't see a need for that. I used buttons on the side facings, and big snaps around the neckline to attach it to the jacket. Buttons secure the lining to the facing. The lining is a quilted padded lining from New York Fashion Center fabrics. It comes in several colors, but their red clashed with our red, so we went with navy. I think it looks quite classic, and almost as if it is original. It was a bit pricey, but I only needed 1 yard to make this. The back was unfinished, which would be fine if you were sewing this into a jacket. Since I assumed that this would be removed fairly often, I enclosed the entire lining, by sewing a flannel shell to the back. Funny, I just realized that I spent more on the lining than I did on the coat! No idea how this snow appeared in my picture. I need to learn more about Picasa! If she ever takes the coat off long enough for me to work on it, I will continue weatherproofing by adding wrist ribbing in the sleeves. What a great fix for a RTW coat. I think you're very clever! Thank you! I would think that it would work just as well for a raincoat with buttons. I got the idea from my old raincoat. Give it a go!